Gov. 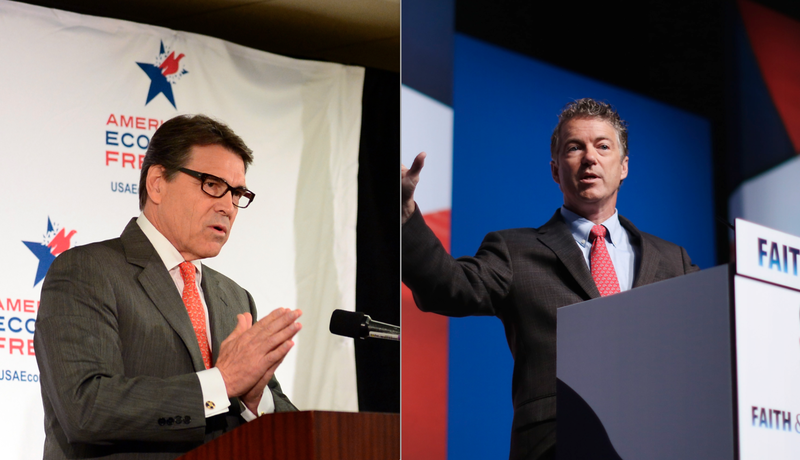 Rick Perry, R-Texas, came down firmly on the hawkish side of the Republican national security debate Saturday, saying "isolationist" figures like Sen. Rand Paul, R-Ky., are "blind" to the threat posed by terrorism. "I can understand the emotions behind isolationism," Perry wrote in an op-ed for The Washington Post. "Many people are tired of war, and the urge to pull back is a natural, human reaction. Unfortunately, we live in a world where isolationist policies would only endanger our national security even further." The governor warned about the rise of a group that calls itself the Islamic State in Iraq and Syria, where Islamist militants have steadily gained power and territory in recent months. The fighters there, many with European or American passports, could pose a direct threat to America's security if they're able to carve out a base of operations in the Middle East, Perry argued. "That's why it's disheartening to hear fellow Republicans, such as Sen. Rand Paul (Ky.) suggest that our nation should ignore what's happening in Iraq," Perry wrote. " This represents a real threat to our national security - to which Paul seems curiously blind - because any of these passport carriers can simply buy a plane ticket and show up in the United States without even a visa." But despite that danger, Perry wrote, Paul "still advocates inaction." The Texas governor said the U.S. was left with only "lousy choices" in Iraq and Syria as a result of President Obama's "failed leadership," but he urged the president to "do more with our military and intelligence communities to cripple the Islamic State." The maximalist view of America's role in the world is familiar terrain for Perry: During his short-lived 2012 presidential campaign, the governor advocated sending American troops back into Iraq after they'd already departed the country in 2011. Perry also criticized Paul for comparing his national security orientation with that of former President Ronald Reagan, a revered figure among Republicans, in a recent op-ed for The Wall Street Journal. "Paul conveniently omitted Reagan's long internationalist record of leading the world with moral and strategic clarity," Perry wrote, likening Paul's "policy of inaction" to those who preached "accommodation and timidity in the face of Soviet advancement" during the Cold War. In his own op-ed last week, Paul preached a cautious response to the violence in Iraq, saying America shouldn't rush headlong into another war in the Middle East without thinking it through. "Many of those clamoring for military action now are the same people who made every false assumption imaginable about the cost, challenge and purpose of the Iraq war," he wrote. "They have been so wrong for so long. Why should we listen to them again?" Paul also criticized his fellow Republicans, though he didn't name anyone specifically, for claiming "the mantle of Ronald Reagan on foreign policy" without taking a more nuanced look at how Reagan conducted himself on the world stage. The op-eds from Paul and Perry, who are both weighing presidential bids in 2016, are only the latest signs of friction within the GOP about the party's path forward on foreign policy. On one side of the divide are figures like Paul, who have said Republicans often seem too eager for war, and that America should only intervene if they have a pressing, tangible interest in doing so. On the other are people like Perry and Gov. Chris Christie, R-N.J., another potential presidential candidate who has tussled with Paul over national security policy in the past. They've more fully embraced the interventionism of former President George W. Bush, saying America can't retrench its global presence and still expect to be able to shape international events.